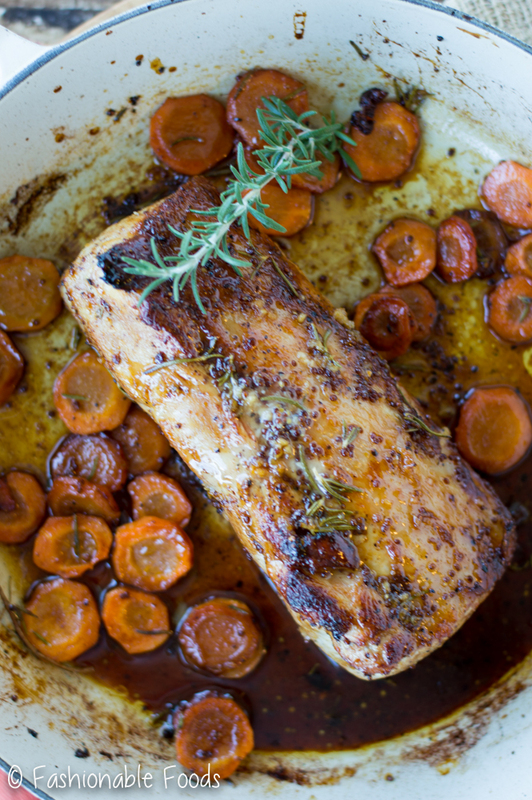 Apple glazed pork tenderloin is an easy weeknight meal that’s full of flavor and healthy, too! 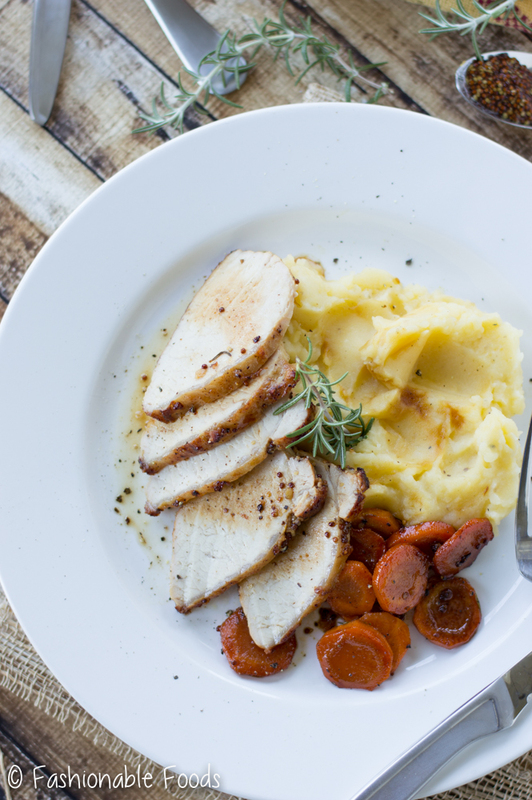 Serve with carrots and roasted garlic mashed potatoes for the perfect fall meal. Few things are more comforting than a good ole meat and potatoes meal. Except for maybe this. Or this. Clearly pasta wins when it comes to comfort food for me. Although depending on my mood, I’d totally take a big bowl of mashed potatoes over pasta. Especially when those mashed potatoes are served with a juicy pork tenderloin covered in a sweet and tangy glaze. ? The best part of this recipe? It’s healthy comfort food! 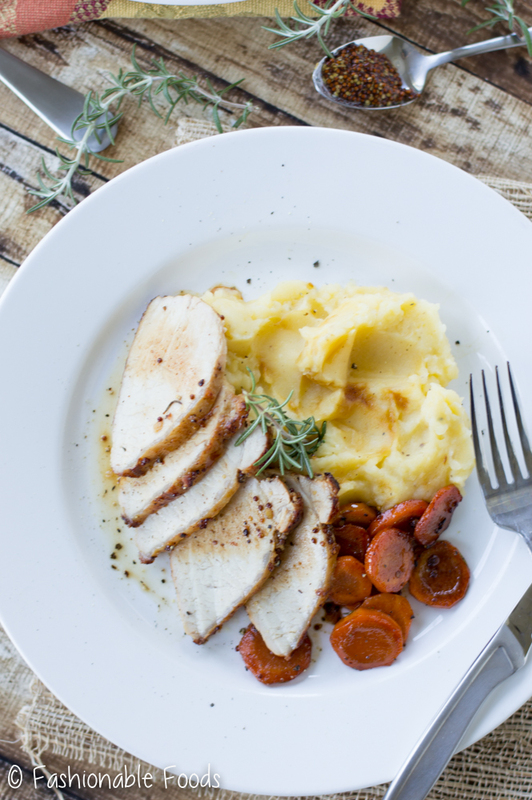 If you’re doing a Whole30, you’re going to want to keep reading! It can be really hard to eat healthy once fall hits. We all want that comfort food, right? Well this is the perfect example that you can have your cake and eat it too. Healthy comfort is definitely a thing, especially when it doesn’t taste healthy! 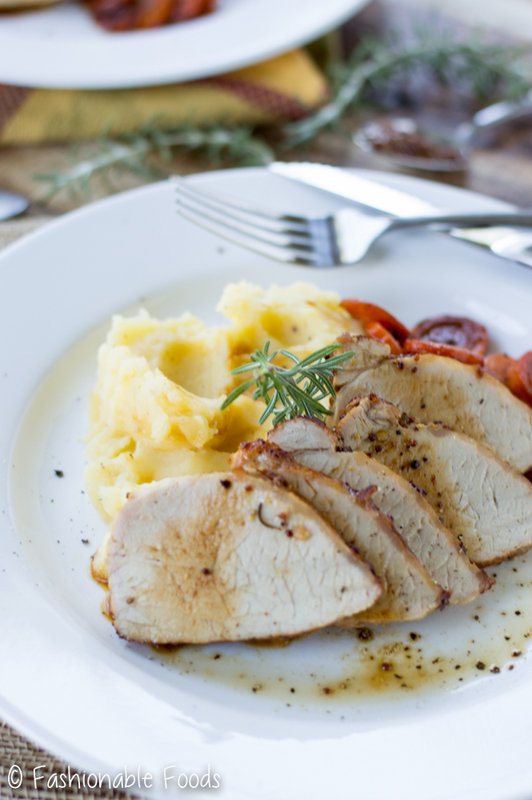 Pork goes insanely well with apples, so this apple glazed pork tenderloin is a no-brainer. The glaze is really simple to make; reduced apple juice, mustard, garlic, and rosemary. It’s not a thick sugary glaze, it’s thin and has the perfect balance of sweet and savory. The carrots cook right along with the pork and get flavored by that glaze, too. Yum! 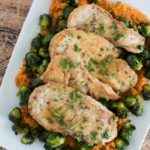 You may be wondering how this recipe is Whole30 and dairy-free when there are mashed potatoes on the plate. Well, these mashed potatoes contain no butter and no cream… or dairy of any kind! They are flavored with roasted garlic, chicken broth, and olive oil or ghee. If you’re feeling indulgent and not doing a Whole30 or eating dairy-free, a dollop of butter on top certainly never hurt anyone. But without it you definitely won’t miss the dairy in these potatoes! 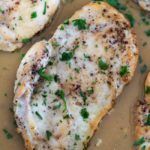 They are still creamy and are actually more flavorful because of the roasted garlic and chicken broth! You may be thinking the roasted garlic might be overpowering, but I promise it’s not! You just need to use a small head of garlic, which gives the perfect amount of sweet roasted garlic flavor. If you’re craving some comfort food, but need to keep the waistline in check, this is the recipe for you! Delicious and easy! Cut the top off of the garlic and season it with salt and pepper. Drizzle it very lightly with olive oil and wrap it up in foil. Roast the garlic for 30-40 minutes or until fragrant and soft. Set aside to cool. Place the apple juice in a small pot and bring it to a boil. Reduce it down by half – this will take around 20-25 minutes. Stir in the mustard and garlic and let it cook another few minutes while you prepare the pork. Season the pork generously with salt and pepper. Heat the olive oil in a dutch oven or cast iron pan until very hot. Sear the pork on all sides until deeply golden brown. Turn off the heat. Stir the rosemary into the glaze (the glaze will be really thin) and brush about a 1/3 of it evenly over the pork. Place the pan in the oven and set a time for 10 minutes. After 10 minutes, add the carrots around the pork and brush half of the remaining glaze over the pork. Return the pan to the oven and roast for another 10 minutes. Brush the remainder of the glaze over the pork and put it back in the oven for another 5 minutes. At this point, check the internal temperature – I take mine out at 145º and let it rest for 10 minutes before slicing and serving. If you like yours closer to well done, let it go a little longer. To make the potatoes, bring them to a boil in salted water and cook for around 15 minutes or until fork tender. Drain and return to the pot over low heat to remove excess moisture. Season the potatoes with salt and pepper and squeeze in the roasted garlic. Mash the potatoes using your preferred method (with a masher, food mill, or mixer) and slowly add in the chicken broth. You may need more or less depending on the texture you like your potatoes. I like them a bit soft and loose, so I use 1 cup of chicken broth. Stir in the olive oil or ghee (or butter if you’re not doing Whole30 or dairy-free). Serve the pork alongside the carrots and potatoes. *If you're not doing a Whole30 or eating dairy-free, the grass-fed butter is a nice indulgence! I’m all for some meat and potatoes comfort fall food. This tenderloin sounds perfect for the cooling weather and I do love carrots. I’m not Whole 30, but I’ll sure eat that whole plate of deliciousness! 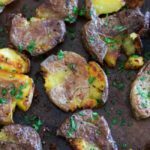 Meat and potatoes is my version of perfect comfort food! 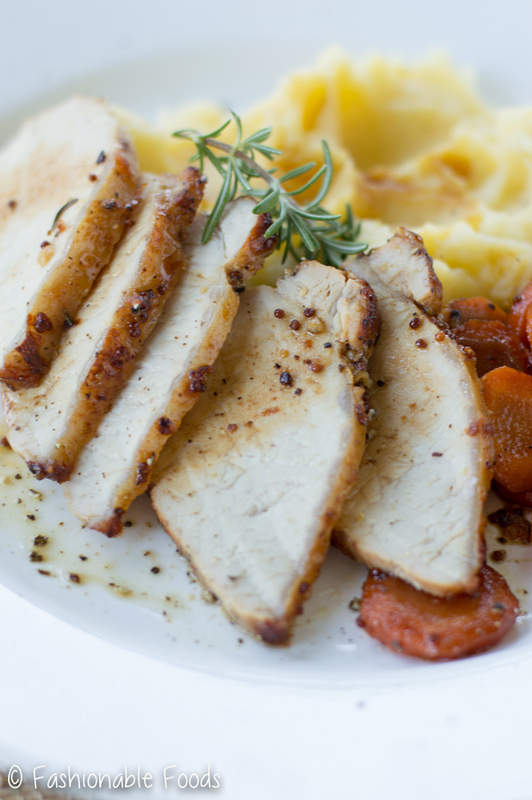 You just can’t go wrong with a classic, especially when pork tenderloin is involved! Love the apple glaze, Keri! And those mashed potatoes look perfect! OMG, YES YES YES YES to pork with apples!! To me that is totally fall comfort food.. but then again, so is pasta. 😉 This dish is EVERYTHING, Keri! I love the apple glaze and those roasted garlic mashed taters are totally calling my name! Plus I’m a huge fan of carrots. Clearly I need this dish in my life. Stat. Wish you lived closer because I’d ask if you deliver. <3 Cheers! My youngest boy is going to love this. Pock chop is his favorite food. Like that’s pretty much the first thing he’ll order when we go out to eat majority of the time. I’m going to try the slices first. But that doesn’t work I’ll try to adapt the recipe to pork chops with the bone on. 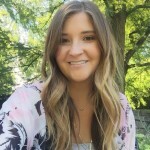 Marjo recently posted…Can a Pregnant Woman Drink Wine? This is one of the best Whole 30 dishes I have had in a while. Thank you! The only thing I did different is leave out the roasted garlic from the potatoes. Although, I did that because of my daughter’s taste. I bet it would be tasty. Hi Melinda. I think this would work in a crockpot – I’d brown the pork and reduce the glaze and then combine in the crockpot and cook on low. My only concern would be the sugars in the apple juice burning, so I’d recommend trying it when you’re home to keep an eye on it! So this is Whole30 all the way? 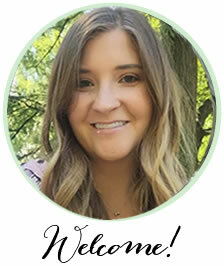 I’m new to Whole30, and don’t want to mess up. This sounds AMAZING!! Made this tonight for dinner and it was amazing. 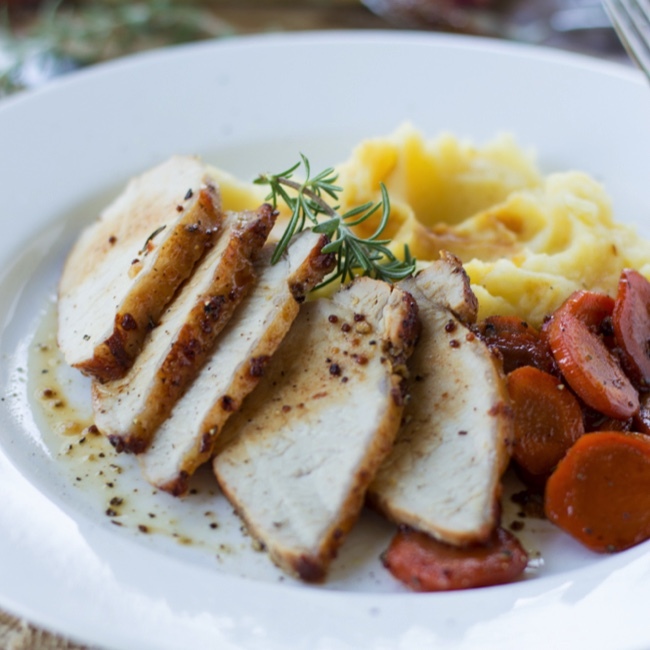 I make pork tenderloin often and usually use a balsamic or fig sauce. This glaze was fabulous and was so tasty with the carrots. Thank you so much!